One of the best classroom management strategies I have found is to have a warm up activity ready for students immediately upon entering the classroom. Over the past several years, I put together this 100 slide powerpoint of daily warm ups. One is up on the projector every day for my US History classes and usually connects to a lesson we covered the previous day. Each slide is visually engaging, with pictures, cartoons, charts, or quotes from history and connects to state and Common Core Standards. The full powerpoint is available to download here. Since using these warm ups I have found my students are immediately more engaged and are demonstrating greater comprehension of the material. 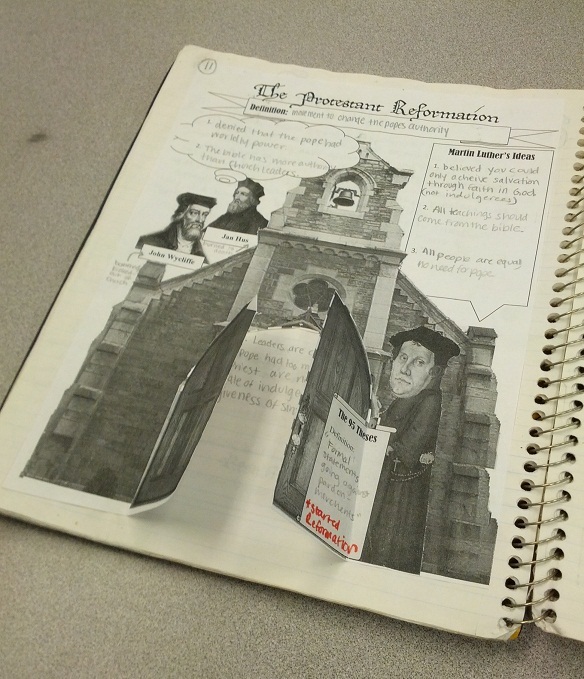 This visually inventive graphic organizer is like a pop-up book for students to organize essential information on Martin Luther, his 95 Theses and the beginning of the Protestant Reformation. To reinforce the problems within the Catholic Church, students cut open the church doors and write the problems of the church underneath the doors. So the problems are literally inside the church! This is a fantastic, creative activity that works especially well with my English language learners, special education students, and visual or kinesthetic learners. You can download the entire bundled lesson plan here! Hope you find the lesson useful! One of the most difficult things about planning a wedding was the seating arrangements. My wedding had tables of 8 and we struggled to put together groups with things in common who would enjoy each other's company. We're throwing a 20% off sale at our online teacher resource store in honor of "Cyber Monday". Every Students of History resource is 20% off for the rest of today. Please head over to our our store and check out our powerpoints, graphic organizers, worksheets, bundled lesson plans, and more! Want to really get your students attention during a typical powerpoint presentation? How about if the old portraits look around the room, smile, laugh, wink, and sneeze! I got bored adding the same old portraits to my slides and tried to think of a way to make them more engaging. I thought back to the magic portraits in the Harry Potter movies and then found a way to make them! The program CrazyTalk allows you to edit any portrait into a moving "magic" video. It takes a lot of work to make them perfect, but I started on a few and got addicted. A free sample of an animated King Louis XVI embedded into a powerpoint slide is available for download here. The actual powerpoint file with all 24 slides and 9 videos is available for purchase here. You can edit this powerpoint or use it immediately as is in your French Revolution lesson to startle your students! This was the 2nd video Students of History produced and features 3 more high school students explaining essential state and Common Core Standards in American History. This episode focuses on the American Revolution - why it happened, key events, and the results. Again, it was written and narrated entirely by students - in a way the "flipped classroom" model, but in a more fully developed way. Over the past few years, 3D blockbusters have dominated the box office. The draw that these have had me wondering if the technology could be brought into the classroom. Perhaps surprisingly, the technology has been around for a long time. Anaglyph 3D images were actually developed in 1852! As a result, a number of fantastic anaglyph 3D images are available that can be used in your classroom. These use the old, cheap red/cyan 3D glasses you might remember from early 3D movies. I bought a package of them for cheap on eBay (search for "red/cyan 3D glasses") and created a few powerpoint lessons that utilize the images. When I passed them out as students entered the door, they were immediately engaged and excited for the lesson. This one is on The Age of Imperialism for my World History II students. It includes over 30 fantastic 3D images that relate directly to the content World History students need to know. Here is a link to where you can purchase this powerpoint. I created a graphic organizer that students used for the powerpoint and they placed in their notebooks. This can be downloaded for FREE here. Here is one of our first Students of History videos! This one covers the early American colonies. The video was written and narrated entirely by high school students. The concept of the "flipped classroom" is that if students watch videos like this at home before coming to class, it leaves more class time for questions, debate, and higher level discussion. We also believe that sometimes students can better explain topics to their peers better than historians, authors, or even teachers. Hope you enjoy it and please let us know in the comment section if you have any feedback!